The State College Police Department says investigators have identified the suspect wanted for allegedly stealing women's underwear from an apartment building laundry room. State College police Lt. Keith Robb says in response to media coverage of the wanted suspect investigators received information that led to the suspect's identity. Police will release the suspect's information once charges are filed. Police say a man was captured on video taking underwear from a laundry room about 10 p.m. Saturday at the Meridian building in the 600 block of East College Avenue. 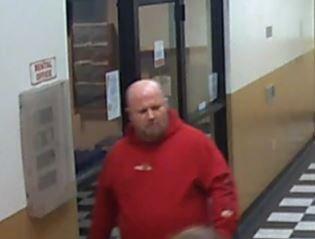 Police described the male suspect as a bald, heavy set man with a light colored goatee who was wearing a red Orange County Choppers hooded sweatshirt, and appears to be in his 30's or 40's. Police say surveillance cameras captured the suspect entering the apartment building and then the laundry room where he allegedly stole women's underwear from a dryer. Anyone who can identify the male can contact State College police at 814-234-7150. The NCAA continues to defend the validity of the consent decree reached with Penn State in the wake of the Jerry Sandusky child sexual abuse scandal. 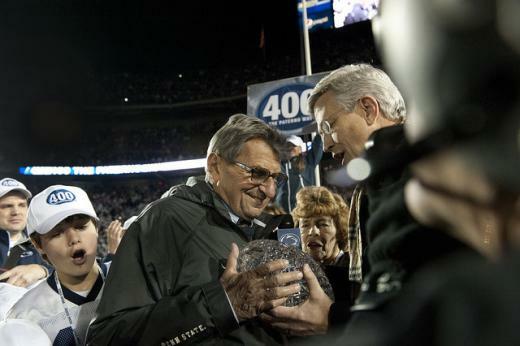 The decree included unprecedented sanctions against Penn State's football program as Sandusky, a former Penn State football coach, abused children on campus and Penn State employees allegedly knew about the abuse and tried to cover it up.